You don't want your house to look like every other on the block, so why should your house numbers? Skip the obvious offerings at the hardware store in favor of custom-painted numbers on a planter. 1. Select a font from your computer (or browse online at fonts.com). Enlarge and print the numbers in various sizes to see which works best on your planter. 2. Using an ink-jet printer and waterproof paper, print the numbers in desired size, on a single sheet if they fit. If using a laser printer, print the numbers on regular paper and trace onto waterproof paper. 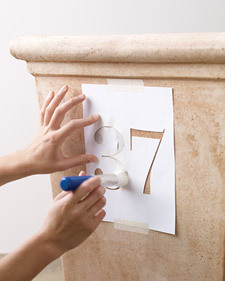 Make a stencil by cutting out the numbers with a craft knife. 3. If the numbers were printed separately, tape stencils together, spacing numbers about 3/4 inch apart. Use masking tape to adhere stencil to planter. 4. Choose acrylic paint in a color that stands out from the planter. Use a sponge or a stencil brush to dab paint into stencil. Let dry, and remove stencil. New tall camellia pot, $160, evanpeters.com.